Definition at line 43 of file llfloaternamedesc.h. Definition at line 67 of file llfloaternamedesc.cpp. References FALSE, gDirUtilp, LLDir::getDirDelimiter(), mFilename, mFilenameAndPath, and mIsAudio. Definition at line 163 of file llfloaternamedesc.cpp. Definition at line 171 of file llfloaternamedesc.cpp. Definition at line 193 of file llfloaternamedesc.cpp. Referenced by LLFloaterAnimPreview::onCommitName(), and postBuild(). Definition at line 226 of file llfloaternamedesc.cpp. 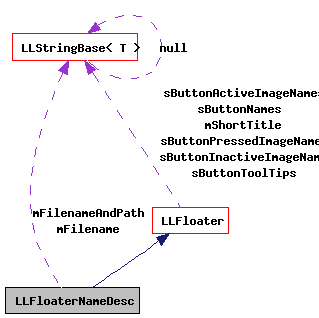 Definition at line 203 of file llfloaternamedesc.cpp. 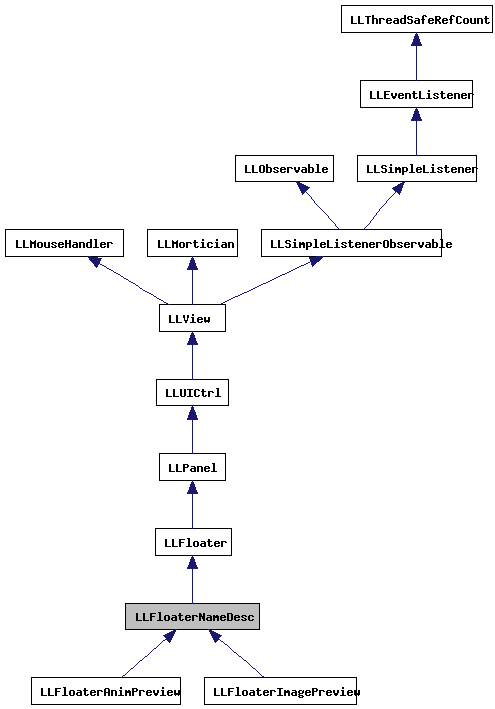 References LLSD::asInteger(), LLSD::asString(), LLAssetType::AT_NONE, LLPanel::childDisable(), LLPanel::childGetValue(), LLFloater::close(), LLInventoryType::IT_NONE, mFilenameAndPath, mIsAudio, S32, and upload_new_resource(). Definition at line 185 of file llfloaternamedesc.cpp. Reimplemented in LLFloaterAnimPreview, and LLFloaterImagePreview. Definition at line 81 of file llfloaternamedesc.cpp. References centerWindow(), LLPanel::childSetAction(), LLPanel::childSetCommitCallback(), LLPanel::childSetValue(), DB_INV_ITEM_DESC_STR_LEN, DB_INV_ITEM_NAME_STR_LEN, doCommit(), f, LLRectBase< Type >::getHeight(), LLUICtrlFactory::getLineEditorByName(), LLControlGroup::getS32(), LLRectBase< Type >::getWidth(), gSavedSettings, llfloor(), llmin(), mFilename, mIsAudio, LLView::mRect, onBtnCancel(), onBtnOK(), LLLineEditor::prevalidatePrintableNotPipe(), PREVIEW_HPAD, PREVIEW_LINE_HEIGHT, r, LLStringBase< char >::replaceChar(), LLStringBase< char >::replaceNonstandardASCII(), S32, LLPanel::setDefaultBtn(), LLLineEditor::setMaxTextLength(), LLLineEditor::setPrevalidate(), LLFloater::setTitle(), LLStringBase< char >::stripNonprintable(), LLStringBase< char >::trim(), TRUE, and y.
Referenced by LLFloaterImagePreview::postBuild(), and LLFloaterAnimPreview::postBuild(). Definition at line 59 of file llfloaternamedesc.h. Referenced by LLFloaterNameDesc(), postBuild(), and LLFloaterAnimPreview::postBuild(). Definition at line 58 of file llfloaternamedesc.h. Referenced by LLFloaterImagePreview::LLFloaterImagePreview(), LLFloaterNameDesc(), onBtnOK(), and LLFloaterAnimPreview::postBuild(). Definition at line 56 of file llfloaternamedesc.h. Referenced by LLFloaterNameDesc(), onBtnOK(), and postBuild().